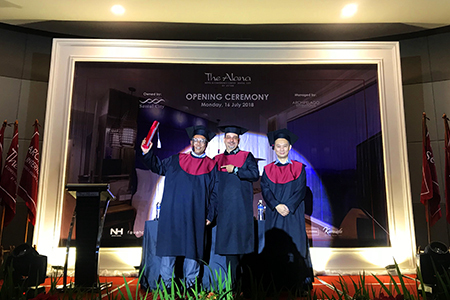 Jakarta, July 2018 – This month, another brand new address is welcomed into Archipelago International's ever-growing family of hotels with the opening of The Alana Hotel & Conference Center - Sentul City. 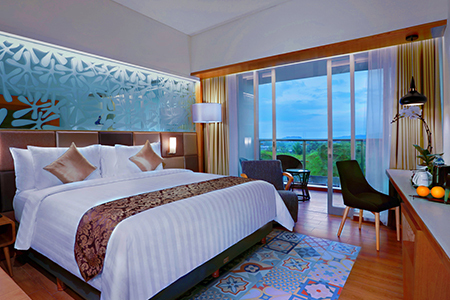 After the success of previous Alana Hotels in Central and Eastern Java, Archipelago International now has its sights set on other areas of the country to continue the growth of this contemporary 4-star brand. The Alana Hotel & Conference Center - Sentul City is the fourth Alana Hotel in Indonesia, and the most comprehensive MICE destination in the vicinity. Sentul City is a planned community that lies within the Bogor Regency – an area already popular as a weekend destination thanks to its mild hillside climate. It lies just 40 minutes’ drive south of Indonesia’s capital, and with the help of another two Archipelago International properties and several mid-market hotels in the area, has developed into one of the country’s most popular MICE destinations. Alana Hotels are the brainchild of Archipelago International, an Indonesian-based hotel management group with Hawaiian roots and an underlying portfolio of more than 200 Hotels and Resorts. In Hawaiian, Alana means “fair, beautiful or offering“, and as such, the brand has been conceptualized to offer sophisticated yet friendly 4-star designer hotels with style and unprecedented levels of service. "As South East Asia’s leading hotel management company with a rapidly expanding pipeline in Indonesia, Malaysia, the Middle East and Cuba, Archipelago International has always been keen to spot future demand trends developing in new destinations. We see Sentul as a burgeoning MICE and leisure destination, which is why we believe that the opening of The Alana Hotel & Conference Center – Sentul City will be paramount to the expansion of Sentul as a modern destination, and for the Alana brand itself," said Norbert Vas, Vice President of Business Development for Archipelago International. Armed with a generous number of guestrooms and meeting rooms – all adorned with timeless contemporary Javanese designs – The Alana Hotel & Conference Center - Sentul City is set to become the leading MICE center in the area. All of its 271 modern and comfortable rooms are fitted with comfortable beds, sleek bathrooms, televisions with various channels, and other homey amenities like writing desks, coffee & tea makers, and spacious wardrobes, whilst outside of the rooms guests can make use of the charming coffee shop, swimming pool, gym, and rooftop lounging area. Meeting planners and party organizers are spoiled for choice with the collection of 14 meeting rooms and mini ballroom - all with complete facilities. Strategically located at the gateway of Sentul, the hotel boasts easy access to both Jakarta and Bogor city. Various entertainment centers such as Bellanova Country Mall, Jungle Land, and Gumati Water Park are located within 20 minutes’ drive to the hotel, and the famous Pasar Ah Poong is just a 5 minutes walk away. A variety of convenient facilities such as ATMs, government districts, convention centers, and even a golf course is located just 30 minutes from the hotel. To enjoy a 10% discount, use the promotion code "BOOKDIRECT” on www.alanahotels.com. Stay connected and receive special rates year-round with the Archipelago Membership mobile app. Follow The Alana Hotel & Conference Center - Sentul City on social media, and share your precious moments by using the hashtag #alanahotels.